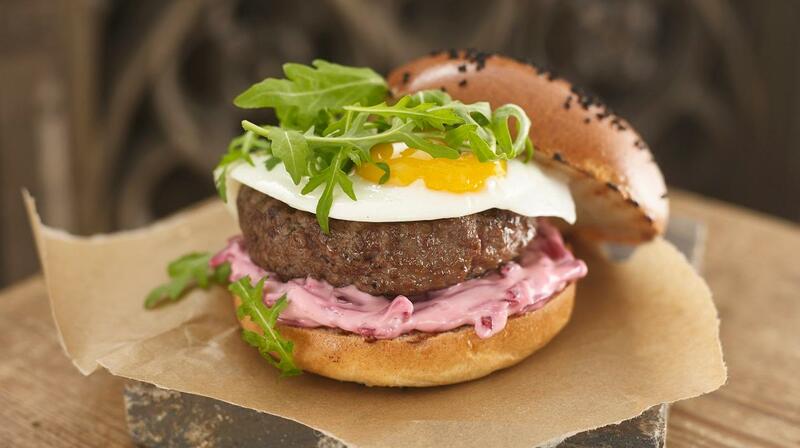 An Australian inspired burger, perfect for your summer menu, with a base of beetroot mayonnaise topped with a fried egg. An Aussie classic! Take the beef mince and mix together with the egg and salt. Take into 10 even sized balls and press into a ring mould to the desired diameter. Cut the beetroot into fine strips and mix through the HELLMANN'S Real Mayonnaise together. Mix through some picked thyme leaves. Wash and dry the rocket. Grill the burger patty to the desired temperature. When the burger is cooked and is resting, grill the bun. Fry the eggs to order. To build the burger place the beetroot mayonnaise on the base of the bun. Place the burger patty on top, add on the fried egg and top with rocket. Top with the burger bun lid.